The real-life uncle to ten nieces and nephews, Matt McLean ventured into the organic juice business in 1999 with a passion for healthy living as well as a long family history of growing citrus in Florida. Matt’s goal was, and still is, to produce the highest quality juice, using only premium 100% organically-grown fruit that is free from synthetic fertilizers, GMOs and pesticides. Matt’s family expertise dates back four generations to his great-grandfather, Angus Benjamin McLean, who learned firsthand how to grow quality citrus without the help of today’s synthetic fertilizers and pesticides. His son, William Benjamin McLean (“Pappy”), carried on his father’s tradition, honing his growing philosophy, which advocates stewardship of the soil as the means to producing the healthiest, most nutritious crops possible. Today, Matt –– as CEO of Uncle Matt’s Organic –– carries on his family’s traditions of growing quality citrus. 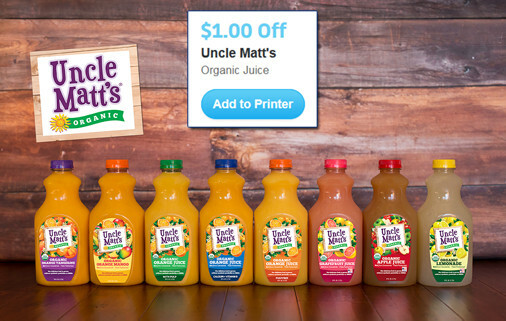 Uncle Matt’s Organic will continue to position itself for the future with a steadfast commitment to healthy living, organic farming, and certainly not least of all, organic fruit and juices sold nationwide in fine retailers. By working with numerous organic growers and combining the latest information on juice quality with family expertise, Uncle Matt’s Organic is a brand name that can be counted on for bringing home the healthiest juice under the sun! Get a $1.00 Off Coupon HERE.